Riverside Natural Foods Ltd. president Nima Fotovat (above left) and Propack president Chris Follows stand in front of the recently-installed new dual robotic top-loader utilizing the high-speed ABB IRB FlexPicker pick-and-place robot (below) to automate the process of finished granola bars inside the cartons in one smooth continuous process. As one of the world’s most versatile breakfast and snack foods, granola offers food processors plenty of leeway for recipe innovation and experimentation. And for those companies who truly master it, the rewards can be massive. So massive, in fact, that producing enough to meet the red-hot market demand can become a real problem. “Although that’s our Number One challenge right now, I must say that it’s a pretty good challenge to have,” says Nima Fotovat, president of the fast-growing granola processor Riverside Natural Foods Ltd. in Vaughan, Ont., located literally across the street from Toronto’s northern boundary along Steeles Avenue. “To put it simply, we need to figure out how we can produce more product within the same more or less fixed parameters, such as available facility space or human resources,” Fotovat told Canadian Packaging on a recent visit to Riverside’s operations. Founded by Fotovat in 2013, Riverside has made lightning fast progress in establishing itself as a promising new force in the highly competitive market segment with unique new recipes developed to turn granola’s popular perception of a healthy-but-boring blends of rolled oats and nuts right onto its head. Drawing on his long experience in the Canadian nutrition-bar industry and a natural entrepreneurial knack for food innovation, Fotovat proceeded to create the unique new MadeGood line of granola bars and treats, fortified with real vegetables, at the company’s original Riverside’s 100-percent allergen- and-nut-free facility in Vaughan. Organic, school-safe and packing the same amount of nutrients as one serving of vegetables, the whole-grain MadeGood granola snacks – offered in standard-shaped and sized MadeGood Granola Bars and the bite-sized, ball-shaped MadeGood Granola Minis – are also low in sugar and vegan- and kosher-certified to boot. “According to Fotovat, the combination of flavours and healthy all-natural ingredients tapped a rich vein of growing demand by health-conscious Canadian consumers for an enjoyable and nutritious alternative to the multitude of sugar-packaged nutrition bars already out in the market. 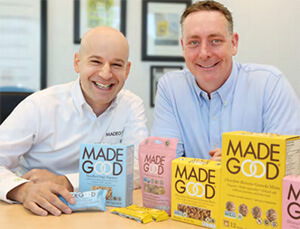 “We have enjoyed pretty good growth,” says Fotovat, explaining the company’s recent opening of a brand new 27,000-square-foot BRC (British Retail Council) food safety-certified plant that recently started up just across a parking lot driveway where the peanut-free facility makes the MadeGood brand products. 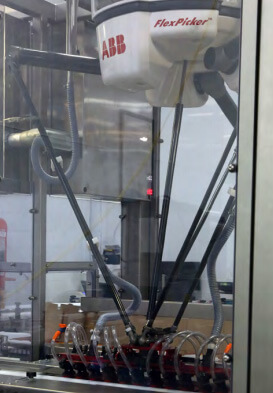 A close-up view of the EOAT (end-of-arm tooling) picking up and placing wrapped granola bars 12 at a time into an open carton at the new Riverside Natural Foods facility in Vaughan, Ont. The new Riverside Natural Foods plant houses two production lines equipped with Mettler-Toledo Safeline X-33 X-Ray inspection equipment. According to Fotovat, the company’s rapid growth has been aided to some extent by the timely rise of the healthy organic, allergen-free, gluten-free and the portable food categories. “But I also like to think that we have continued to achieve success in this competitive marketplace because we offer innovation, good service and, above all, a quality food product that the consumer finds highly appealing,” Fotovat proclaims. 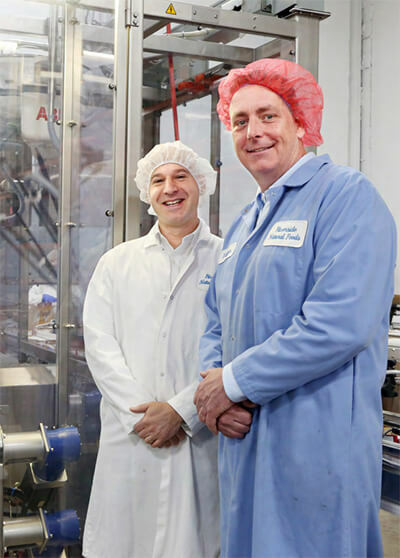 “I do think that what sets us apart is the quality of our snack bars – not just from a taste sense, because it is very tasty, but also because of the life quality we bring to every unit produced here. “We choose our ingredients very carefully,” Fotovat explains. Fotovat points out that Riverside only uses gluten-free, organic oats to add to the whole grains contained in the MadeGood product recipes. “There’s only a few sources for oats like this in Canada, and just a handful more in the U.S.,” says Fotovat. 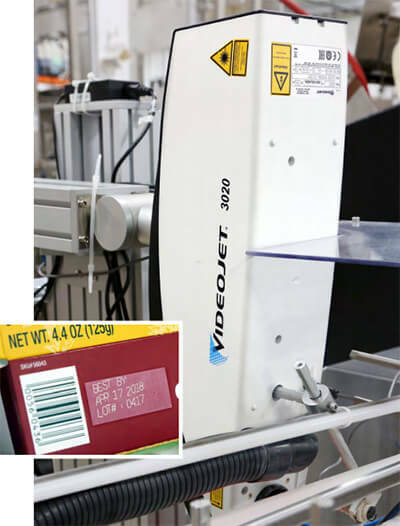 A Videojet 3020 laser-coder applies best-before info and lot code data onto each carton formed by the Genesis carton former from Kliklok-Woodman, now part of the Bosch Group. “We use pure, organic, big flake oats and brown rice crisps – two whole grains that contain healthy amounts of fiber, vitamins, minerals, antioxidants and disease-fighting phytochemicals,” he says. According to Fotovat, all the products manufactured by Riverside use a pure, cold-pressed, high oleic sunflower oil that is high in unsaturated fat, low in saturated fat and has zero transfats, which are all highly sought-after product attributes in terms of combating the risk of heart attacks, strokes and heart disease. In addition to producing the MadeGood brand, Riverside also does some private-label work for some leading store brands across Canada and the U.S., and the growing volume of work has not only prompted Riverside to start up a new plant last year, but also invest in some high-end packaging automation technologies at the second facility. One of its more recent capital investments involved the installation of a dual robotic loader manufactured by leading robotics design and manufacturing company Propack, a prominent Canadian vendor and integrator of automation technology operating out of Beamsville, Ont. “The LJ robotic pick-and-place machine picks 12 wrapped bars at a time and feeds them into formed paperboard boxes,” Fotovat relates. “By installing the LJ module, we were able to move seven people from performing the same manual job over to other aspects of our production line to help remove bottlenecks. The Genesis carton former from Kliklok-Woodman is a top-loading, lock-style, high-speed machine designed to facilitate quick product changeovers to minimize production line downtime. As Fotovat relates, the Propack team used its extensive experience and knowledge of packaging systems integration to fit seamlessly into the plant’s product equipment layout, comprising one processing line and two packaging lines. After the granola ingredients are mixed, formed, cooled and shaped to appropriate product size, the product continues along the same conveying line towards two packaging lines, that are used at the same time before converging back into one line to proceed to case-packing. As Propack owner and president Chris Follows explains: “We take freshly made product from one line and distribute product to two wrapping legs. Each wrapping leg receives a row of product, meters, and then turns the bars from long-side leading to short-side leading. There’s then an electronic inspection of the bars to ensure dimensional accuracy. “The distribution line of each row is also inspected to ensure the presentation of the bar is correct for acceptance by each leg,” reveals Follows. In the event the leg is not acceptable, it is placed on an accumulation conveyor so as to not disrupt the operation of the production line. The operator-friendly Allen Bradley PanelView Plus 1500 HMI (human-machine interface) from Rockwell Automation is used to monitor and operate the Propack LJ dual robotic loader. Fotovat says that getting the conveyor line’s timing to drop and raise took some clever software programming on Propack’s part to achieve equal product distribution along the two packaging lines. In order to prevent the product sticking together along the conveyor belting, the plant uses an InFlight FT seamer from Benchmark Automation, featuring Rockwell Automation’s Allen-Bradley PanelView Plus 700 interface terminal – to move the product along short conveyors at different speeds. 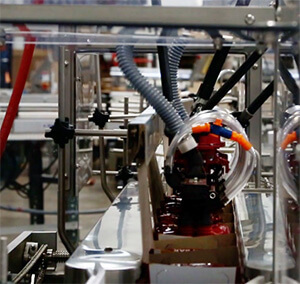 Each packaging line is equipped with the high performance Revolution model flowwrapping system manufactured by Campbell Wrapper Corporation, with each machine’s precision-driven servomotors also controlled by an Allen-Bradley interface. “The Campbell Revolution wrapper is designed to create an end seal and a cross-seal giving Riverside a perfectly hermetic package seal,” says Follows. 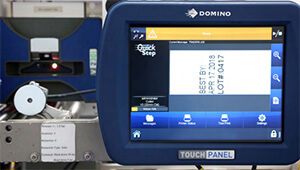 As the film unwinds from the machine’s reel, a Domino V230i thermal-transfer printer swings into action to apply the best-before and lot-code information onto the plastic wrapping film before it is wrapped around the product. Using pre-printed rollfed film supplied to the plant by Lynnpak Packaging Ltd., Bemis Flexible Packaging Canada Limited, and Alpha Poly Corporation, the Revolution wrapper uses the eye-marks registered into the film to wrap the bars precisely the way the customers and consumers can best see them on the food bar. 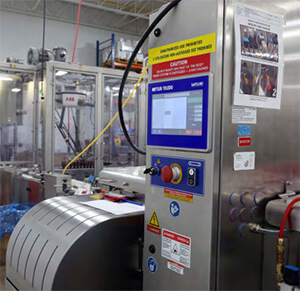 To take care of its uncompromising food safety requirements, each packaging line is equipped with a high-accuracy Mettler-Toledo Safeline X-33 X-Ray inspection system – distributed in Canada by Shawpak Systems of Oakville – for thorough inspection of all products emerging from the flowwrapper. The robust high-speed X-Ray systems inspect every single wrapped granola bar passing through it to detect the tiniest of foreign objects such as metal, glass, ceramics and pebbles, while also helping point out any product density issues. “These Mettler-Toledo Safeline X-Ray units are a great technology that increases our food safety initiatives tremendously,” says Fotovat, praising the machine’s ability not to generate “false positives” because of the metal-foil wrapping used to package the bars. 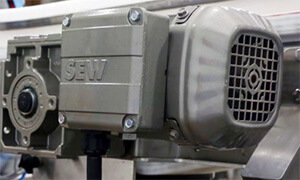 A close-up view of one of many SEW-Eurodrive motors used at the new Riverside Natural Foods production facility to ensure smooth power distribution along the conveyor lines. 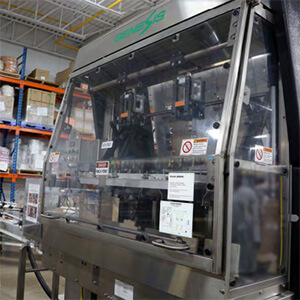 Once the bars are wrapped and sealed, the product moves on to the Propack LJ dual robotic loader, which takes the bars exiting each Campbell flowwrapper into a fully-automated robotic cell equipped with an ABB IRB FlexPicker pick-and-place robotic lift that picks pre-programmed quantities of products to place into open cartons. “Using this flexible top-load technology to place products into the open cartons allows Riverside to add coupons, to pack product varying in weight, and generally help create a very clean final package,” Follows states. According to Follows, the robot’s 15-in Allen-Bradley PanelView Plus HMI conveniently places all the important information required by the operator onto one page of the screen, eliminating the need to flip screens when searching for data. “There’s even a special ‘Green’ icon indicating that all aspects of the machine are up and running optimally,” explains Follows. “If there was an issue, the screen would direct an operator to which area of the machine needs attention, with a fault notice coming up on the screen. 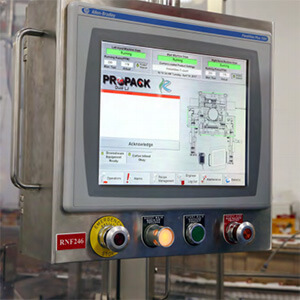 As Follows explains, the HMI on the Propack LJ dual robotic loader saves the parameters of carton changeovers, allowing the operator to quickly choose the required recipe via a simple touch of the screen – and also accumulates data such as how many bars per shift were placed within cartons to generate reports on efficiencies. The cartons packed by the Propack LJ Module are formed with the model Genesis carton manufactured by Kliklok-Woodman, part of the Bosch Group. One of two Domino V230i thermal-transfer, high-resolution printers used by Riverside Natural Foods to apply applicable lot-code and best-before information onto the film used to flowwrap the individual MadeGood granola bars. The Genesis series is part of Kliklok’s family of top-load, lock-style carton forming machines developed to combine high-speed forming with the ability to handle a wide range of carton sizes – the Genesis box former offers remarkably short changeover times of under 15 minutes, which is a major benefit for the busy Riverside plant. “The Genesis is a very unique former that picks up the carton using a vacuum after forming through the cavity, in order to place it onto the conveyor,” Follows explains. “With the lighter type cartons, you still get a positive placement on the conveyor – ensuring no jams occur on the empty carton transportation area. 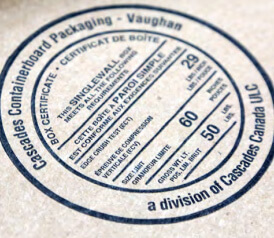 Corrugated master cases used to pack cartons of Riverside product are converted by the local Cascades Containerboard Packaging facility. To close the loaded cartons, the plant employs a Bosch Kliklok Vari-Right carton closer that steadies the open-top cartons, folds the flaps to close the carton, and activates the Nordson ProBlue hot-melt adhesive applicating system to fully seal each box before it’s placed on a pallet. “Like Genesis, the Vari-Right closer can accommodate very quick changeovers,” states Follows. Adds Fotovat: “One of the things that I look for in vendors who might work with us, is their overall culture. It should be a service-oriented culture built on getting the job done without taking shortcuts – the same as Riverside. “While Propack offered us a great piece of equipment that would create better production line efficiency,” he says, “they did much more than just sell us the hardware. They used their outstanding integration skills to tie all the machines into a single streamlined solution,” Fotovat states.